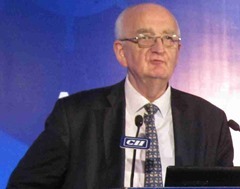 A conference on “Approach to Integrated Maritime Systems” (AIMS 2014) was hosted by Confederation of Indian Industry (CII) and National Maritime Foundation (NMF) at Hotel Hilton, Chennai on 09th, 10th October 2014. Commodore (Retd) S Shekhar, IN, Regional Director, NMF dedicated this Conference to the memory of Emperor Rajendra Chola I, who influenced up to the far east (Burma, Thailand, Cambodia, Malaysia, Laos, Indonesia and Modern Vietnam) with his Chola Navy almost 1000 years back. Panel Discussion I: Maritime Security – Challenges and Opportunities. Panel Discussion II: Approach to Shipbuilding Eco System. Panel Discussion III: Increasing Maritime Assets – Ports and Harbours. Panel Discussion IV: Technology, System and Equipment. Panel Discussion V: Integrated Approach to Research and Development, Skill Development and Capacity Building. Colloquium: Approach to Integrated Maritime Systems as a National Imperative. Welcome Address was given by Mr P Ravichandran, Chairman, CII Chennai Zone & President – Danfoss Industries Pvt Ltd.
“Value for Life” – Experience Sharing by Ms Meghana P Shekhar, Architect: As a survivor of the Indian Ocean Tsunami 2004, she suggested that all personnel in aircrafts, ships/boats must be provided with GPS tracking devices to prevent loss of life; if necessary these devices can be given on collecting a refundable security deposit. Special Address 1, was given by Commodore (Retd) S Shekhar, IN, Regional Director, NMF. Special Address 2, was given by Dr Vijay Sakhuja, Director, NMF. 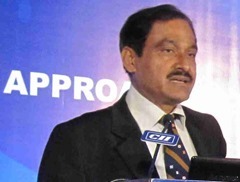 Special Address 3, was given by Mr MA Bhaskarachar, Chairman & Managing Director, Kamarajar Port Ltd: He brought out that as part of the Emperor Rajendra Chola I celebrations, a cruise connecting all historical ports (Ennore to Kanyakumari) of Tamil Nadu is being planned. 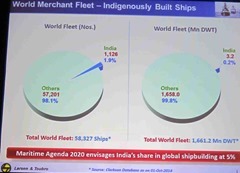 Special Address 4, was given by Commodore K Subramaniam, Chairman & Managing Director, Cochin Shipyard Ltd: He opined that Indian ship buyers still find buying ships from foreign shipyards is more cost effective due to complex Indian taxation system. Address by Guest of Honour, Inspector General SP Sharma, PTM, TM, Commander, Coast Guard Region (East): COMCG(E) cautioned that armed merchant ships posed a threat to coastal security. 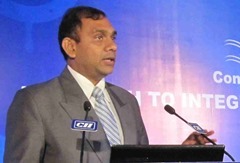 Concluding Remarks by Mr S Narasimhan, Vice Chairman, CII – Puducherry State & Director, Sattva Logistics Pvt Ltd. Skill Development Plan for shipping industry – Cochin Shipyard Ltd (CSL) trains people depending on their entry level qualification; though everyone trained can not be absorbed in CSL, they can easily get employment in any other shipbuilding/ship repair yard. Forewarning to reduce loss of lives due to cyclone – the national media highlights loss of lives and damage to property only after the cyclone hits the shore; instead there has to be a dedicated weather channel region wise to give early warning to common people. Micro, Small, Medium Enterprises (MSMEs) – How to involve MSME sector in large scale, in shipping industry? Presently MSME can supply only low value items; they are unable to meet the requirements of defence sector. MSMEs must be given enough chances to correct themselves instead of throwing them out. Why Indian shipbuilding industry is not competitive in global market? Shipbuilding industry can be competitive only when direct/indirect support is available from the government like other countries. Most of the times, importing parts from abroad is cheaper than buying from Indian market due to complex tax structure in India. Marine Pollution – enough laws, conventions, legislations are available to safe guard the seas. Is there any proactive action being taken to safe guard Indian fishermen from Sri Lanka/Pakistan? Sagar Mala project – is it only for major ports or for all ports? 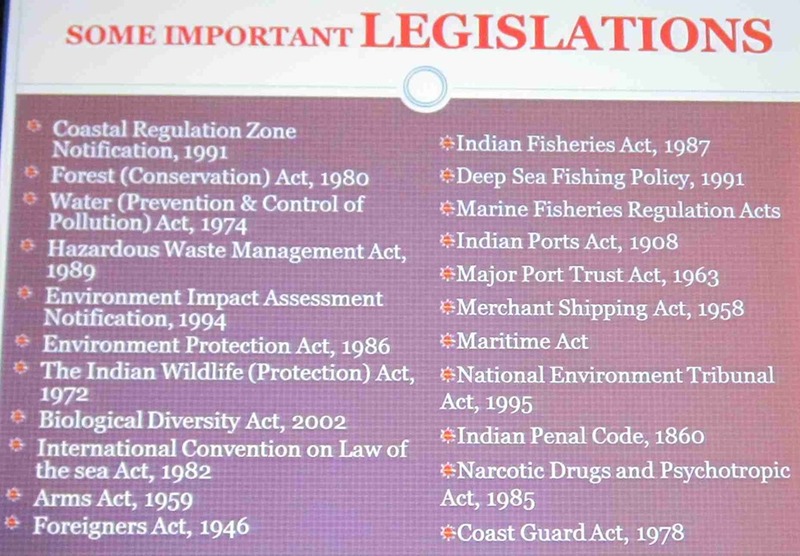 Maritime Laws – needs to be included in this type of maritime conference for discussion. 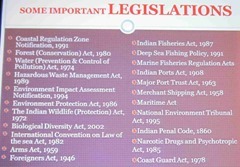 Indian Maritime Agenda 2010 – 2020: It talks about the goals whereas detailed roadmap or blueprint is not available to reach the goal. 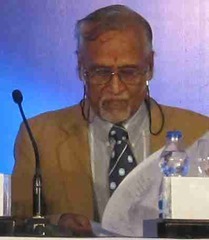 Chairman: Dr Vijay Sakhuja, Director, NMF. Maritime Security and Challenges – Indian Navy Perspective: by Captain S Shyam Sundar, CSO to NOIC, TN&P, Indian Navy. 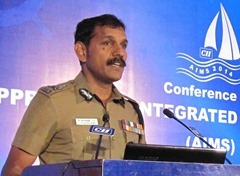 Marine Police Perspective: by Dr C Sylendra Babu, IPS, Additional DGP, Coastal Security Group, Tamil Nadu. Strategic Aspects: by Commodore (Retd) R Seshadri Vasan, Head, Strategy & Security Studies, Centre for Asia Studies. Modern Trends in Maritime Security: Captain (Retd) SK Singh, Indian Navy, Vice President (Defence), Elcome Integrated Systems Pvt Ltd. It is the backbone of the international commerce. Asia – Pacific region is considered as a economic powerhouse. India’s maritime security policy is framed to ensure freedom of navigation and unimpeded lawful commerce. Conventional Warfare: Earlier the role of the Navy was only to ensure that no hostile maritime power degrades national security and interest. LIMO (Low Intensity Maritime Operations): Now no country can afford conventional warfare by ignoring the economic development of the nation; hence there is a need for LIMO. Maritime security policy now encompasses: Political Dimension, Economic Dimension, Social Dimension, Environmental Dimension in addition to Military Dimension of the nation. It is an outcome of the Political, Social and Economic dimensions of the region/country. It is a criminal network, having wide financial links. To protect merchant ships from piracy, armed guards are deployed in merchant ships by the ship owners. Armed guards are provided by Private Maritime Security Companies (PMSC). Around 140 PMSCs are now operating with floating armouries at sea in the North Indian Ocean. Present international regulations are insufficient to monitor the operations of PMSCs. Criminals and anti national elements. Smuggling of gold, narcotics, explosives (lead to Mumbai Bomb Blasts in 1993) and other goods. Infiltration of terrorists (lead to Mumbai attack in 2008); in addition, unregulated PMSCs can be misused for sea based terrorism. Reliable Coastal Security can be achieved by integrating assets of Indian Navy & Coast Guard, Marine Police and with the use of latest technology. Augmentation of force level – by setting up Marine Police Stations with fast patrol boats. Technology - by setting up National AIS Chain, Coastal Radar Chain, e – registration of fishing boats, issuing of biometric identity cards to fishermen. 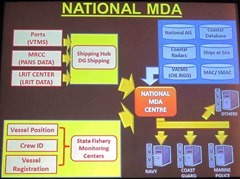 National Maritime Domain Awareness (MDA) – data collected from various maritime stake holders are centrally processed through National Command Control Communication Intelligence (NC3I) Network; actionable intelligence is then passed on to relevant user agencies like Indian Navy, Indian Coast Guard, Marine Police of the states. CSS is under various stages of implementation. 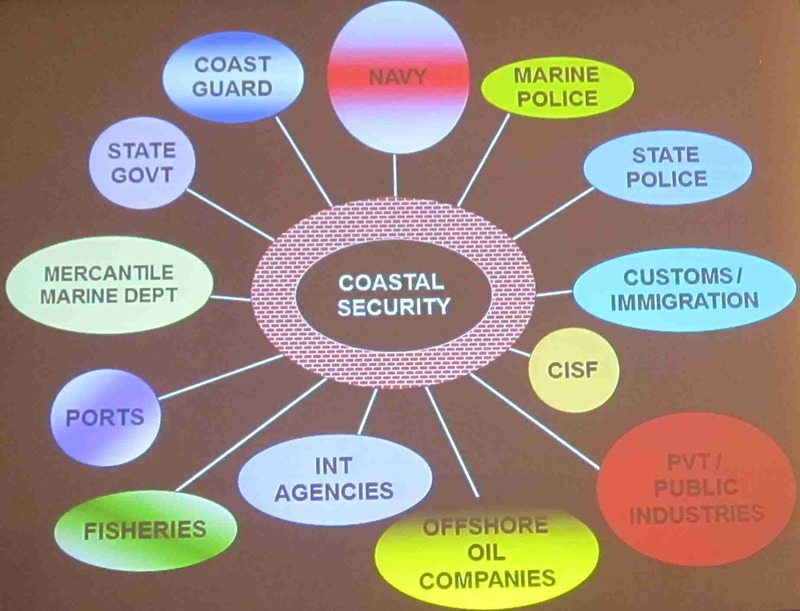 Indigenous technological solutions to address various limitations and gaps in the Coastal Security Scheme through a comprehensive, user friendly and economical means. Earlier much importance was not given for coastal borders like land borders; now coastal borders are also as important as land borders. The responsibility of Coastal Security up to 12 nautical miles from the coast, remains with Marine Police of the respective state; Tamil Nadu has an exclusive Coastal Security Group (CSG). Marine Police is the first responder if there is a breach in coastal security; Marine Police have to comply with many important legislations that range from the year 1860. First time in India, Tamil Nadu CSG has also a strong Marine Home Guards formed by recruiting fishermen. Small Arms and Light Weapons Trafficking. 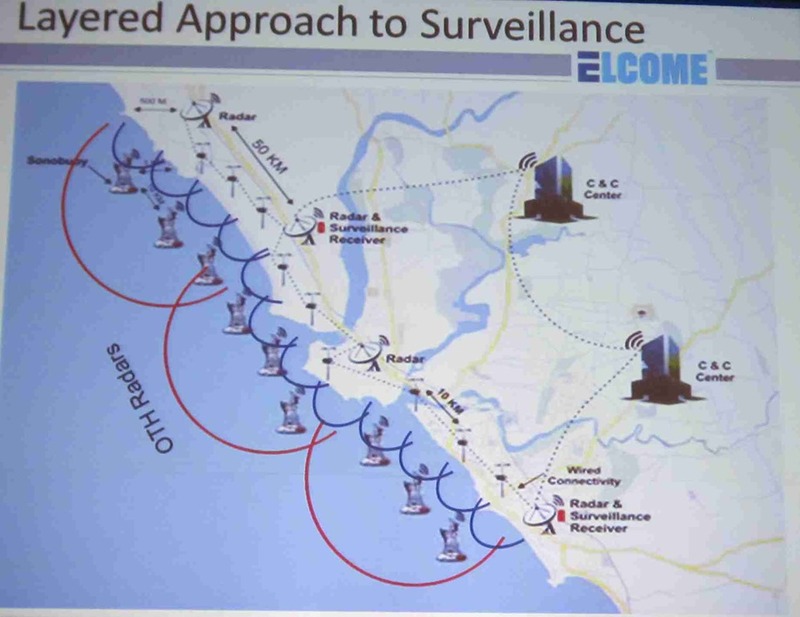 Intelligence gathering – by forming ‘Village Vigilance Committees’ using local fishermen as they are the ‘eyes’ and ‘ears’ of the coastal security. Quick Reaction Team (QRT) comprising Marine Police Commandos. Para motoring for surveillance up to 5 nautical miles. Patrol Boat Maintenance is very costly; cost effective maintenance is needed; there is a proposal to induct Indian Navy/Coast Guard Officer for technical support. There is a proposal to construct 12 jetties for bigger (19 meter, 23 meter) Marine Patrol ships; CII may give necessary expertise/support. China: growing Chinese presence in the Indian Ocean Region. Sri Lanka: berthing of a Chinese submarine in Colombo container terminal in September 2014. Present day Asymmetric Warfare & Terrorism emphasises the need of maritime surveillance. Threat can be either state sponsored or an act by hostile independent bodies/organisations. Damage to marine oil/energy exploration infrastructure. Optical sensors (CCTV Cameras, IR cameras, Laser Illuminated Range Gated cameras). Correlation and data fusion by Command & Control (C & C). Sensors gather data in incoherent fashion. Command & Control (C & C) software makes data coherent by correlating the data to generate Common Operating Picture. Control, Processing, Tracking of data from Radars, EO Sensors, AIS, Sonobuoys, Communication Rx and satellites. Central Alarm and Alert Management. Networking Support and Data Routing. Multiple Sensors at local or remote site. Multiple agencies with their independent sensor networks. Multiple Sensors Multiple Platforms (shore and mobile) data fusion. Uses anomaly detection algorithms and filters to detect unusual behaviour as inherent requirement. Allow for quicker decision making. Provides Interoperability with international agencies. National AIS (NAIS) project: AIS base stations in lighthouses – 74 stations commissioned (phase 1); 11 stations under execution (phase 2). 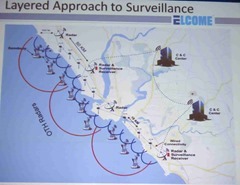 Coastal Static Sensor (CSS): Radar and EOS on lighthouses – 46 stations under execution (phase 1); 38 locations in planning stage (phase 2). AIS Transponders for fishing boats (pilot project On with 1000 units). CSS and NAIS networks can only detect targets up to 25 – 30 nm from the coast. 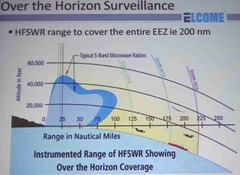 High Frequency Surface Wave Radar (HFSWR) to cover up to 200 nm EEZ (Exclusive Economic Zone). Satellite based Synthetic Aperture Radar. 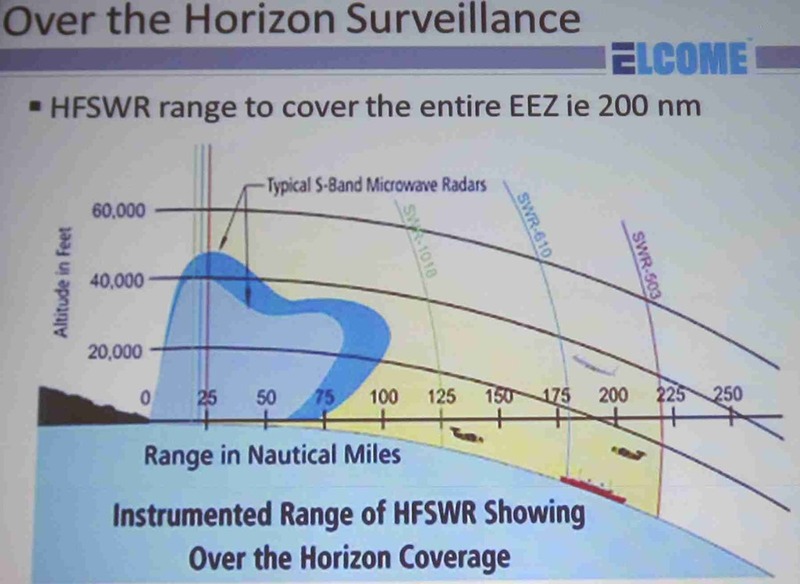 Layer 2: Short range (up to 40 nm) detection – by using Microwave Radar with Target Detection Capability, Radio Surveillance Receivers (Rx), EW systems. Layer 3: Close range detection and identification – by Multiple PTZ video and Thermal Surveillance camera, Range gated laser illuminators, Sonobuoys. Layer 4: C4ISR software with Multiple Regional Command Centres and Nodal Command & Control Centre. Layer 5: National Operations Centre – Organisation empowered for decision making and action would be connected to all Nodal C & Cs together and would be provided with Common Operating Picture. Emerging Trends in Maritime Surveillance. Unmanned Systems are coming up for Aerial, Surface, Underwater surveillance. Tethered blimps are also used for aerial surveillance. Laser Radars (LADARS) are used for accurate target identification with 3D images. Integration of NAIS and CSS. Collaboration with International Stake Holders. A responsible approach to Maritime Domain Awareness is needed for effective maritime surveillance and to promote regional/global economic stability. Maritime Security warrants enduring, participative approach for sharing of information between civilian and military authorities both national, international level. Maritime Surveillance should cover full EEZ by using over the horizon sensors and space based sensors for early warning. Layered approach using OTH capability coupled with close range detection and visual identification techniques will provide effective/actionable surveillance. Advanced data fusion and analytical tools should be deployed as decision support aid. Migration of people through sea to other countries due to climate change/rising sea level. Demographic changes due to climate change/rising sea level are likely to trigger territorial disputes. Wants to be a regional power in the Indian Ocean Region like the US playing a global power. India’s Project ‘Mausam’ and China’s ‘Maritime Silk Route’. India presently has ‘Trust but Verify’ approach. As ISI has made their presence in Sri Lanka, how to prevent 26/11, 2008 Mumbai like attacks in South India in future? How to prevent dumping of e-waste, medical waste in Tuticorin through ships? Indian Navy – accidents happening in ships, submarines are alarming. 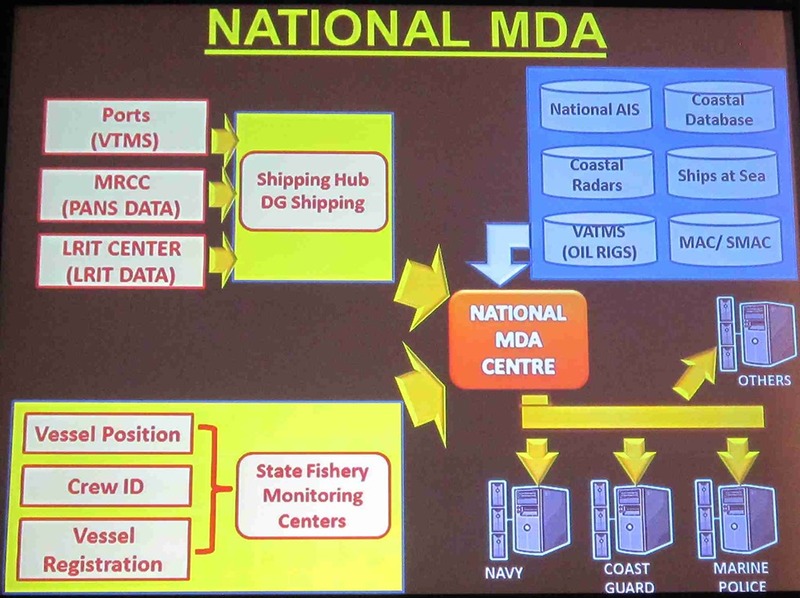 Setting up of a National Maritime Authority. Sea Piracy – Procedure to carry arms, armed personnel by ships at sea must be streamlined and transparent. Chairman: Rear Admiral (Retd) NK Mishra, NM, Chairman & Managing Director, Hindustan Shipyard Limited. Warship building in India: by Commodore (Retd) S Shekhar, IN, Regional Director, NMF. 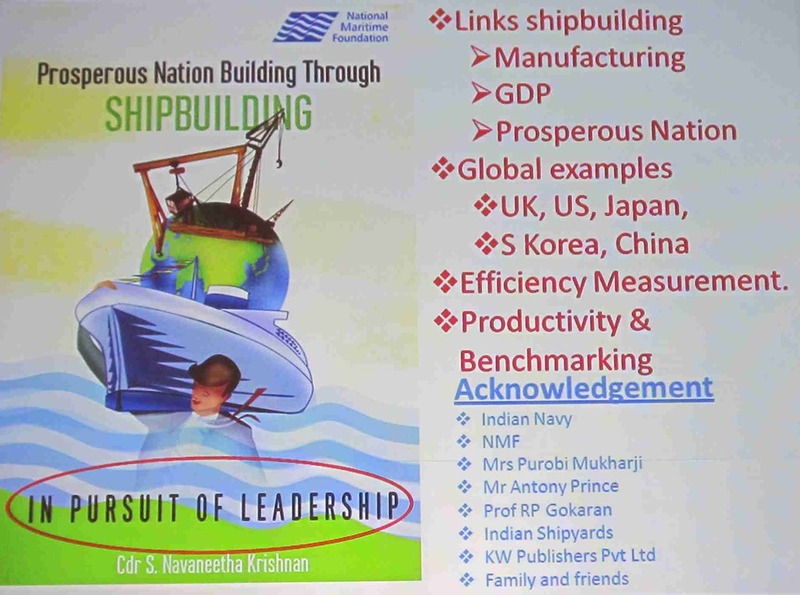 Cost Reduction in Shipbuilding: Commander (Retd) Navaneetha Krishnan, Former Officer in Charge, Shipwright Training School. 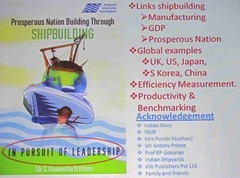 Private Sector Perspective in Shipbuilding: Mr Paras Pal, Deputy General Manager – Defence Shipbuilding Business Unit, Larsen & Toubro Ltd.
Indian Shipbuilding industry lacks both at policy formulation and implementation levels. Indian Shipyards are unable to compete globally in terms cost, quality and delivery schedules. In the coming decade, only the defence shipbuilding sector can lead the Indian Shipbuilding industry. Private shipyards have inadequate orders whereas defence PSUs have enough orders. Collaborative efforts are needed between private, public shipyards in terms of order sharing, design interaction, vendor development and human resource development. India has to design, develop, manufacture all marine engineering, electronic, weapon equipment/systems instead of relying in imports. Performance of Indian marine engineers, technologists, technicians coming out of Indian engineering institutions has to be reviewed. Our ship repair capabilities have to be modernised and productivity oriented. Relationship between Indian maritime research establishment and maritime industry has to be strengthened and more interactive. Cross functional Bill of Material management. Weapons and Sensors in case of Navy/Coast Guard/Marine Police vessels. Who are the designated authorities at various levels to deal with documentation? Do the latest Defence Procurement Regulations take into documentation issues? What is the procedure to be followed for providing inputs to vendors who are contracted to generate documentation? What would be Quality Assurance procedures for the acceptance of contracted documentation? What would be the role of actual users like ship’s crew, trainers, logisticians etc., in the above? Bound to accommodate frequent mid course changes in construction. No significant learning curve due to small batch size. The most challenging task is integration of several vendors, system, technology and human efforts. Micro, Small, Medium Enterprises (MSMEs) are not aware of the opportunities and volume of business available in shipbuilding industry. Defence shipyards have developed the crucial skills needed for designing and constructing sophisticated warships indigenously. Ministry of Defence (MoD) and Department of Defence Production (DDOP) have to coordinate and develop indigenesisation of various Electrical, Electronic, Communication, Engineering equipment/system as a whole. Has a long gestation period. Can be highly rewarding if handled well; otherwise likely to be disastrous. Needs strategies to make it profitable. 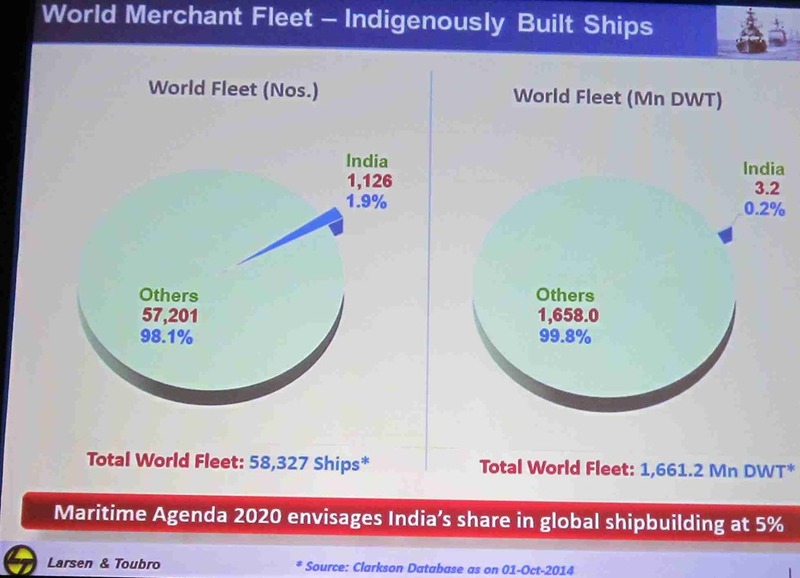 Targets Set for the Indian Shipbuilding Industry: Chapter 18 of Maritime Agenda 2010 – 2020 has listed the targets for the Indian Shipbuilding/Ship Repair industry. 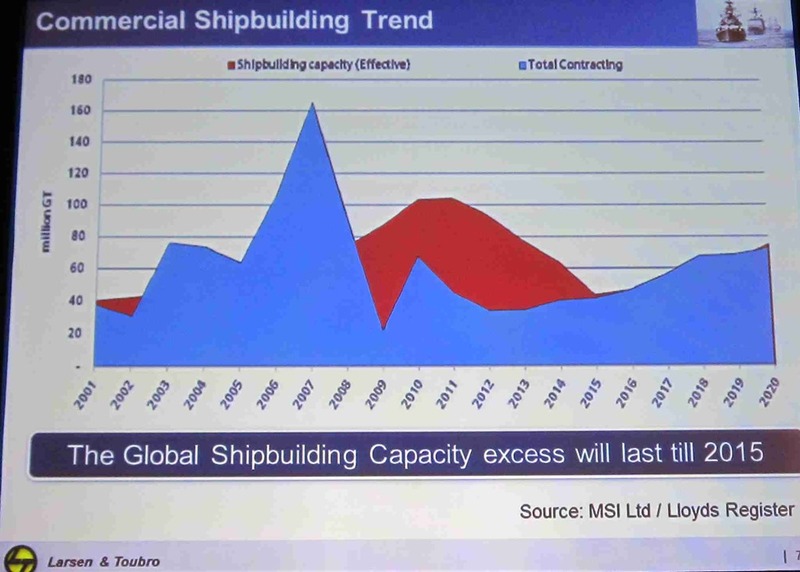 Shipbuilding – Human Resource Gaps: All the stake holders like Academia, Shipyards, Ship owners, Ports, Marine Suppliers have to join together to address the gaps. A high powered multi disciplinary Task Force consisting of individuals with proven track records, representing all sectors of maritime domain has to be set up. The Task Force can be in two levels one as a Steering Committee at the Coceptualisation, Monitoring and Review level reporting to the Prime Minister; the other as a working level reporting to the Steering Committee. The Task Force has to perform in Mission Mode and can be designated as Strategic Augmented Maritime Up-gradation Development and Result-oriented Action Task Force with Shipbuilding as one of the Key Result Areas. It is a commercial activity to generate revenue and subsequently profit. As a social cause to generate employment. It is also a service to society. 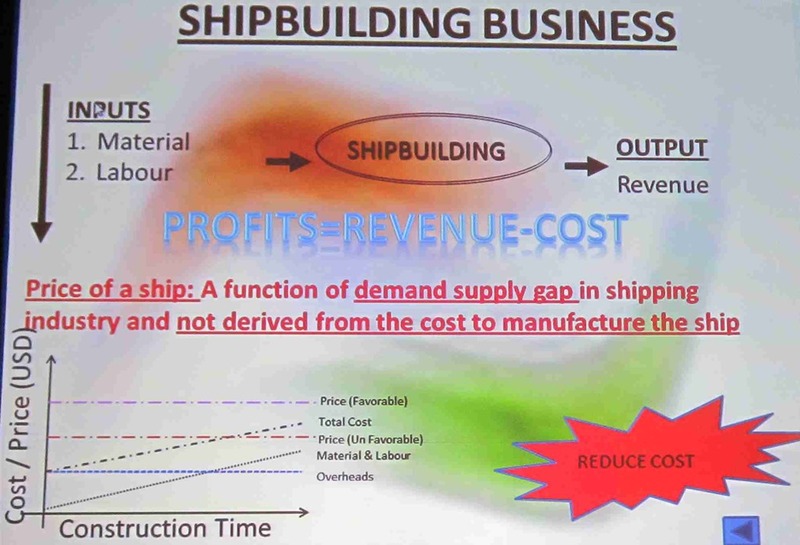 Price of a ship is a function of demand-supply gap in shipping industry and not derived from the cost to manufacture the ship. 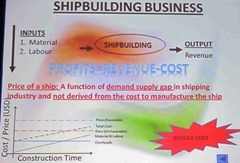 Profit: Revenue – Cost to build ship. Maximise output in given timeframe. Minimise input (Material/Labour including Wastage). Tender & Contract Management – Use experienced people for preparing tender quotation. STQC Management: Gantt Chart, PERT, ABC, PERMIT, PROMPT, COMPROMGENT. Infrastructure – Carry out a Infrastructure vs Cost Analysis. Production Technology – Use Standardisation; Implement Quality System; Use Advanced Technology like Modular Construction. Supply Chain Management – Just in Time Concept. Knowledge Management – Capture Tacit and Explicit Knowledge; Impart Video/Digital Training; Exploit PLM, ERP System. Organisation Culture – Inculcate Cost Conscious Organisation; Restructure Organisation Structure for Fast Decision Making. Innovation – Encourage Out of Box Thinking. Ship Design (if external) by Quality Design and Standardisation of Design. Government: Policies, Subsidies, Taxes, Duties. Force Majeure – Keep eyes and ears open to assess the situation and to foresee the future. Ministry of Defence: Mazagaon Docks, Goa Shipyard, Garden Reach Shipyard, Hindustan Shipyard. State Government: Alcock Ashdown (Gujarat), Shalimar Works (West Bengal). 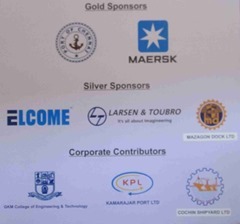 Private Sector: L & T Shipyard, Bharati Shipyard, Pipavav Shipyard, ABG Shipyard. 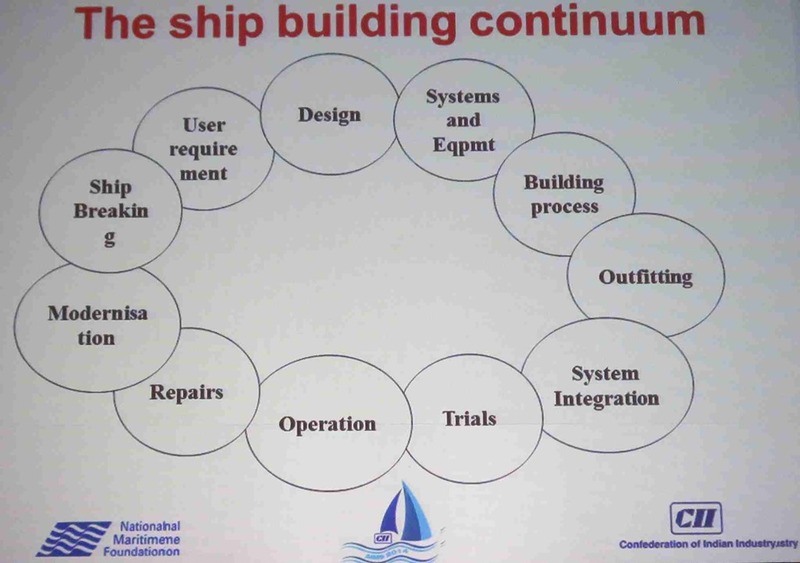 Elements of Shipbuilding Eco System: Specific support is needed to strengthen each element of the Eco – System. Large dependency on imported equipment/material. Delivery delays leading to Liquidity Damages (LD). Loss of precious foreign exchange. Amend offset policy to promote ancilliarisation in India. Equipment standardisation across Indian Shipbuilding Industry. Need to review FERV issue. Bid submission & order placement anywhere between 18 to 30 months for MoD ship acquisition programs. Project Duration ranges from 2 years to 10+ years. 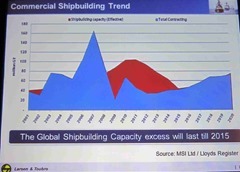 With import content of more than 50%, shipyards face severe FERV risk. Recommendations: Allow FERV to Defence shipbuilding contracts under execution and for all forthcoming MoD projects. Declare shipbuilding as a strategic sector & accord infrastructure status. Availability of funds at nil or minimal interest rates. Declare tax holidays for at least next 10 to 15 years. Promote Public Private Participation (PPP) in frontline warship programs. Release of public version of Indian Navy’s Long Term Perspective Plan. Shorten bid validity to place contract within 9 months from Request For Proposal (RFP) issuance. Reinstate shipbuilding subsidy for at least next 10 years. Only after the sea routes to India were explored, Europeans/British could rule India for centuries. Shipbuilding industry defies all laws of economics. 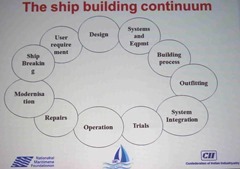 Indian method of shipbuilding leads to delays and it further leads to cost escalation. We have to master ship designing and material procurement/management; we have enough expertise in shipbuilding. Under quoting by shipbuilders to get orders, is not a healthy practice. How MSMEs can meet the requirements of Classification Societies? How to gain expertise without adequate funds? Till MSMEs gain the expertise, instead of supplying to shipbuilders directly, they can supply to other major marine suppliers like L &T.
Is it fair to spend tax payers money in terms of subsidies to shipbuilding industry just to keep the industry going? – if India has to develop as a shipbuilding nation, some compromises have to be made. 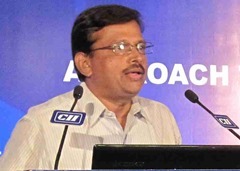 Chairman: Mr Rajeev Ranjan, IAS, Principal Secretary, Government of Tamil Nadu, Highways & Minor Ports Department. Necessity to Improve Berthing Facilities in Ports – Surveyor’s Perspective: by P Sridharan, Former Director, Southern Region, Henderson International India Pvt Ltd.
Container Terminal Operations – Opportunities & Challenges: by Mr Julian Michael Bevis, Senior Director, Group Relations (South Asia), The Maersk Group. 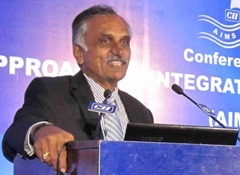 Technological Upgradation of Ports & Harbours – by Mr SV Madabhavi, Chief Engineer, Chennai Port Trust. Productivity Improvement in Ports: by Mr V Krishnasamy, General Manager – Corporate Strategy & Business Development, Kamarajar Port Ltd.
Clear breadth available in the berth. Type of vessels – general cargo vessel, bulk carrier, container vessel, tankers. Tugs – types and number of tugs available. Ship or shore crane to offload on wharf by grabs/net slings; then transport by pay loaders and tippers. Through self Unloading system from ship to shore by conveyors. Cargo to be discharged to hoppers/silos and then by conveyors. From ship to road tanker lorries. Through permanent shore pipeline connected to shore tank terminal. Floating cranes in case of heavy load. Transit sheds (covered or uncovered). Facilities needed in covered warehouse. Maintenance of shed/roof/good house keeping. Shore pipeline maintenance, pressure test. Pig clearance and associated machinery. Maintenance of Non Return valves at shore tank terminal. Containers: Adequate foundation, paved floor depending on number of maximum tiers to be stacked. Road Link – to ensure smooth flow of vehicles in/out of the port. Rail Link – rail lines have to be structured inside port to ensure smooth flow of wagons. Conclusion: Preventive/break-down maintenance is needed in the entire port infrastructure to prevent loss of lives, property. Policy regarding logistics/supply chain can not be made in isolation. Customs legislation is applied differently in different parts of India. Level playing field is needed for everyone involved in logistics/supply chain. Logistics in manufacturing sector – Manufacturing is the backbone for the economic progress of the nation and logistics/whole supply chain needs to be given its due importance. Problems relating to supply chain has to be seen as a collective problem instead of passing it as ‘it is your problem or my problem’. India’s logistics/supply chain is very expensive comparing to other countries. PPP model in logistics/supply chain – Legislations need to be reviewed and conducive for operation/progress. Market forces must be given a free hand in logistics/supply chain instead of a regulatory mechanism; pricing should not be regulated by a regulator; market forces must decide on that. Logistics is not rail, road, sea port, air port, warehouse in isolation; it has to be a collective entity. Infrastructure development in rail, road connectivity is needed for cost effective logistics/supply chain. Port Infrastructure – It is immaterial how big the port is or the port infrastructure; how competitive is the port to handle supply chain is more relevant. Operations – India’s personnel involved in logistics/supply chain are relatively ineffective/unproductive; needs a attitude change. India is a extra ordinary nation with extra ordinary people and challenges can always be met successfully. Most of the ports including Chennai port is now land locked due to development of surrounding area and due to this port development/expansion is affected. Obsolescence of technology is very fast in Ports. As the size of the ships, volume of cargo to be handled keeps on increasing, ports are unable to upgrade overnight to fulfill these requirements. Now as the ports are switching over to Public Private Participation (PPP mode), the upgradation of ports is expected to be faster and efficient. Has taken steps to reduce the waiting time for the transports entering/leaving the port. Rail network within the port is being restructured to ensure faster evacuation. It is desirable to discharge cargo from the ship within 24 hours. Project cargo defies conventional cargo and handling is getting tough. Time for evacuation is different for different type of cargo. Dwell time for some cargo like granite, wood in harbour is in months and harbour space is not optimally utilised. Cargo like fertiliser has to be bagged/packaged before evacuation. Most of the cargo needs further road, rail transportation for evacuation. Environmental/Pollution Control Authority is coming up with stringent regulation for cargo storage (like covered shed for coal); this is further going to increase cost. Cargo handling facilities developed and operated through Public Private Partnership (PPP). KPL has implemented Port Operations Management System (POMS) through NIC. KPL is electronically exchanging messages with its stake holders like Shipping Agents, Importers/Exporters etc., through Port Community System (PCS). KPL is also exchanging EDI messages with Customs Department through PCS. All charges are collected through RTGS, NIFT & e – payments gateway of PCS. All Tenders/Quotations are published in KPL website and also in e – publishing & e – procurement sites of CPP Portal. All Tenders of value more than Rs 10 Lakhs, the bids are received only through e – procurement. KPL has implemented ERP System through NIC and is operational from 01st October 2014. The only mantra for productivity improvement in ports is ‘Attitude’ that requires a change. Day 1 sessions concluded with these three Panel Discussions.